Coilhose Pneumatics has invested a lot of resources in improving the coiled air hose product on which they built much of their success. Successive improvements to the product’s quality have expanded the line to include different reusable hoses. The Flexeel Reinforced Polyurethane Coil hose maintains the original reinforced polyurethane coil design, with a braided interior core and a weatherproof, protective outside jacket. True to its Flexeel brand name, this line of hoses features an excellent memory, which makes the hoses highly flexible and adaptable to many use conditions. Though the reinforced polyurethane core is super tough, the hose itself is remarkably lightweight. The fittings on the air hoses are reusable and easy to repair, even from the field. The same hose is also available with strain relief fittings, which restricts hose bending to allow unimpeded air flow. An alternative to the Flexeel Reinforced Polyurethane Coil hoses that isn’t as flexible is the Flexcoil with Reusable Strain Relief Fittings. Still lightweight, these hoses are kink resistant, and remain permanently coiled through their use life. The hoses are mainly used in the automotive industry. They also come with reusable and field repairable brass fittings and are offered with or without strain relief fittings. There are further variations of the same hoses, with another, Flexcoil with Quick Connect Fittings that are fitted with the same reusable brass fittings but with a connector or integral coupler. This saves you time you would otherwise be spending attaching the quick connects. For those with work stations that need to be cleaned off regularly with a blowgun, like those that use abrasive tools, the same Flexcoil with Quick Connect Fittings hose is offered with a blow gun on the Flexcoil with Blow Gun. And those people that just require the hose without any fittings or accessories are catered for too. The Flexcoil without Fittings hose can be adapted to whatever your use requirements are. Since the hoses are designed with a diameter of 16 and 18 inches on the tool and air source end respectively, there is no need for an additional whip hose. Another type of hose made from an alternative material are the nylon hoses. Nylon Coil with Fittings offer a significantly greater retraction force than Flexcoil polyurethane hoses. Made from tough nylon materials, these hoses have superior abrasion resistance and, because of their strong retraction force, are easier to store away when not in use. They come with fittings machined in-house from a high quality brass hex stock. Like all the other Coilhose Pneumatics’ hoses, the swivel fittings on the Nylon Coil with Fittings hoses come with a sealant already applied. The nylon range of hoses also includes Nylon Coils with Quick Connects, Nylon Coils with Blow Gun, and the Bulk Nylon Coil without Fittings. However, if your needs demand a stronger industrial grade hose, the Stowaway Coil with Fittings is a more than suitable choice. These hoses have thicker walls to provide additional protection against abrasion, grease, and gasoline. They are constructed from a nylon resin with has great abrasion and moisture resistance. They too come with strong, reusable brass fittings and strain relief fittings. Twin Bond Nylon Coils with Fittings, on the other hand, offer two paths for transferring fluids or air instead of the standard single channel hose. They are also made from nylon, which is highly durable and offer greater retraction force. Besides that twin hose feature, twin bond hoses offer the same features and benefits as the other nylon hoses. The twin bond hose is also offered without fittings. The Flexeel and Flexcoil coiled hose ranges are supported by a full fittings’ spare backup. There will likely be instances where a Strain Relief Fitting, the Strain Relief itself, Hose Nut, Hose Splicers, the standard Reusable Fittings, or the ends on the Flexeel Max series hoses get lost. These can be ordered separately by referring to the parts catalog. 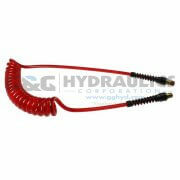 The replacement parts are the same quality as those on the hoses that are sold with fittings. PUE516-254-TY Coilhose Flexeel Coil, 5/16" x 25', 1/4" NPT Rigid Strain Relief Fittings, T..
PUE516-254-T Coilhose Flexeel Coil, 5/16" x 25', 1/4" NPT Rigid Strain Relief Fittings, Tr..
PUE38-504B-TR Coilhose Flexeel Coil, 3/8" x 50', 1/4" NPT Swivel Strain Relief Fittings, T..
PUE38-504B-T Coilhose Flexeel Coil, 3/8" x 50', 1/4" NPT Swivel Strain Relief Fittings, Tr..
PUE38-25B-TY Coilhose Flexeel Coil, 3/8" x 25', 3/8" NPT Swivel Strain Relief Fittings, Tr..
PUE38-25B-TR Coilhose Flexeel Coil, 3/8" x 25', 3/8" NPT Swivel Strain Relief Fittings, Tr..
PUE38-25B-T Coilhose Flexeel Coil, 3/8" x 25', 3/8" NPT Swivel Strain Relief Fittings, Tra..
PUE38-25A-TY Coilhose Flexeel Coil, 3/8" x 25', 3/8" NPT Rigid & Swivel Strain Relief ..
PUE38-25A-TR Coilhose Flexeel Coil, 3/8" x 25', 3/8" NPT Rigid & Swivel Strain Relief ..
PUE38-25A-T Coilhose Flexeel Coil, 3/8" x 25', 3/8" NPT Rigid & Swivel Strain Relief F..
PUE38-254A-T Coilhose Flexeel Coil, 3/8" x 25', 1/4" NPT Rigid & Swivel Strain Relief ..
PUE38-254-TY Coilhose Flexeel Coil, 3/8" x 25', 1/4" NPT Rigid Strain Relief Fittings, Tra..
PUE38-254-TR Coilhose Flexeel Coil, 3/8" x 25', 1/4" NPT Rigid Strain Relief Fittings, Tra..
PUE38-254-T Coilhose Flexeel Coil, 3/8" x 25', 1/4" NPT Rigid Strain Relief Fittings, Tran..
PUE38-25-TR Coilhose Flexeel Coil, 3/8" x 25', 3/8" NPT Rigid Strain Relief Fittings, Tran..
PUE38-25-T Coilhose Flexeel Coil, 3/8" x 25', 3/8" NPT Rigid Strain Relief Fittings, Trans..
PUE38-20B-TY Coilhose Flexeel Coil, 3/8" x 20', 3/8" NPT Swivel Strain Relief Fittings, Tr..
PUE38-20B-TR Coilhose Flexeel Coil, 3/8" x 20', 3/8" NPT Swivel Strain Relief Fittings, Tr..
PUE38-20B-T Coilhose Flexeel Coil, 3/8" x 20', 3/8" NPT Swivel Strain Relief Fittings, Tra..
PUE38-20A-TY Coilhose Flexeel Coil, 3/8" ID x 20', 3/8" NPT Rigid & Swivel Strain Reli..
PUE38-20A-TR Coilhose Flexeel Coil, 3/8" x 20', 3/8" NPT Rigid & Swivel Strain Relief ..
PUE38-20A-T Coilhose Flexeel Coil, 3/8" x 20', 3/8" NPT Rigid & Swivel Strain Relief F..
PUE38-204-TR Coilhose Flexeel Coil, 3/8" x 20', 1/4" NPT Rigid Strain Relief Fittings, Tra..
PUE38-204-T Coilhose Flexeel Coil, 3/8" x 20', 1/4" NPT Rigid Strain Relief Fittings, Tran..
PUE38-20-TR Coilhose Flexeel Coil, 3/8" x 20', 3/8" NPT Rigid Strain Relief Fittings, Tran..
PUE38-20-T Coilhose Flexeel Coil, 3/8" x 20', 3/8" NPT Rigid Strain Relief Fittings, Trans..
PUE38-15B-TY Coilhose Flexeel Coil, 3/8" x 15', 3/8" NPT Swivel Strain Relief Fittings, Tr..
PUE38-15B-TR Coilhose Flexeel Coil, 3/8" x 15', 3/8" NPT Swivel Strain Relief Fittings, Tr..
PUE38-15B-T Coilhose Flexeel Coil, 3/8" x 15', 3/8" NPT Swivel Strain Relief Fittings, Tra..
PUE38-15A-TY Coilhose Flexeel Coil, 3/8" x 15', 3/8" NPT Rigid & Swivel Strain Relief ..
PUE38-15A-TR Coilhose Flexeel Coil, 3/8" x 15', 3/8" NPT Rigid & Swivel Strain Relief ..
PUE38-15A-T Coilhose Flexeel Coil, 3/8" x 15', 3/8" NPT Rigid & Swivel Strain Relief F..
PUE38-154-TY Coilhose Flexeel Coil, 3/8" x 15', 1/4" NPT Rigid Strain Relief Fittings, Tra..
PUE38-154-T Coilhose Flexeel Coil, 3/8" x 15', 1/4" NPT Rigid Strain Relief Fittings, Tran..
PUE38-15-TY Coilhose Flexeel Coil, 3/8" x 15', 3/8" NPT Rigid Strain Relief Fittings, Tran..
PUE38-15-TR Coilhose Flexeel Coil, 3/8" x 15', 3/8" NPT Rigid Strain Relief Fittings, Tran..
PUE38-15-T Coilhose Flexeel Coil, 3/8" x 15', 3/8" NPT Rigid Strain Relief Fittings, Trans..
PUE38-10B-TY Coilhose Flexeel Coil, 3/8" x 10', 3/8" NPT Swivel Strain Relief Fittings, Tr..
PUE38-10B-TR Coilhose Flexeel Coil, 3/8" x 10', 3/8" NPT Swivel Strain Relief Fittings, Tr..
PUE38-10B-T Coilhose Flexeel Coil, 3/8" x 10', 3/8" NPT Swivel Strain Relief Fittings, Tra..
PUE38-10A-TY Coilhose Flexeel Coil, 3/8" x 10', 3/8" NPT Rigid & Swivel Strain Relief ..
PUE38-10A-TR Coilhose Flexeel Coil, 3/8" x 10', 3/8" NPT Rigid & Swivel Strain Relief ..
PUE38-10A-T Coilhose Flexeel Coil, 3/8" x 10', 3/8" NPT Rigid & Swivel Strain Relief F..
PUE38-104-TR Coilhose Flexeel Coil, 3/8" x 10', 1/4" NPT Rigid Strain Relief Fittings, Tra..
PUE38-104-T Coilhose Flexeel Coil, 3/8" x 10', 1/4" NPT Rigid Strain Relief Fittings, Tran..
PUE38-10-TR Coilhose Flexeel Coil, 3/8" x 10', 3/8" NPT Rigid Strain Relief Fittings, Tran..
PUE38-10-T Coilhose Flexeel Coil, 3/8" x 10', 3/8" NPT Rigid Strain Relief Fittings, Trans..
PUE14-50B-T Coilhose Flexeel Coil, 1/4" x 50', 1/4" NPT Swivel Strain Relief Fittings, Tra..
PUE14-30B-T Coilhose Flexeel Coil, 1/4" x 30', 1/4" NPT Swivel Strain Relief Fittings, Tra..
PUE14-30A-TY Coilhose Flexeel Coil, 1/4" x 30', 1/4" NPT Rigid & Swivel Strain Relief ..
PUE14-25B-TY Coilhose Flexeel Coil, 1/4" x 20', 1/4" NPT Swivel Strain Relief Fittings, Tr..
PUE14-25B-TR Coilhose Flexeel Coil, 1/4" x 20', 1/4" NPT Swivel Strain Relief Fittings, Tr..
PUE14-25B-T Coilhose Flexeel Coil, 1/4" x 20', 1/4" NPT Swivel Strain Relief Fittings, Tra..
PUE14-25A-TY Coilhose Flexeel Coil, 1/4" x 20', 1/4" NPT Rigid & Swivel Strain Relief ..
PUE14-25A-TR Coilhose Flexeel Coil, 1/4" x 20', 1/4" NPT Rigid & Swivel Strain Relief ..
PUE14-25A-T Coilhose Flexeel Coil, 1/4" x 20', 1/4" NPT Rigid & Swivel Strain Relief F..
PUE14-256-T Coilhose Flexeel Coil, 1/4" x 20', 3/8" NPT Rigid Strain Relief Fittings, Tran..
PUE14-25-TY Coilhose Flexeel Coil, 1/4" x 20', 1/4" NPT Rigid Strain Relief Fittings, Tran..
PUE14-25-TR Coilhose Flexeel Coil, 1/4" x 20', 1/4" NPT Rigid Strain Relief Fittings, Tran..
PUE14-25-T Coilhose Flexeel Coil, 1/4" x 20', 1/4" NPT Rigid Strain Relief Fittings, Trans..
PUE14-20B-TY Coilhose Flexeel Coil, 1/4" x 20', 1/4" NPT Swivel Strain Relief Fittings, Tr..
PUE14-20B-TR Coilhose Flexeel Coil, 1/4" x 20', 1/4" NPT Swivel Strain Relief Fittings, Tr..
PUE14-20B-T Coilhose Flexeel Coil, 1/4" x 20', 1/4" NPT Swivel Strain Relief Fittings, Tra..
PUE14-20A-TY Coilhose Flexeel Coil, 1/4" x 20', 1/4" NPT Rigid & Swivel Strain Relief ..
PUE14-20A-TR Coilhose Flexeel Coil, 1/4" x 20', 1/4" NPT Rigid & Swivel Strain Relief ..
PUE14-20A-T Coilhose Flexeel Coil, 1/4" x 20', 1/4" NPT Rigid & Swivel Strain Relief F..
PUE14-206-TY Coilhose Flexeel Coil, 1/4" x 20', 3/8" NPT Rigid Strain Relief Fittings, Tra..
PUE14-206-T Coilhose Flexeel Coil, 1/4" x 20', 3/8" NPT Rigid Strain Relief Fittings, Tran..
PUE14-20-TY Coilhose Flexeel Coil, 1/4" x 20', 1/4" NPT Rigid Strain Relief Fittings, Tran..
PUE14-20-TR Coilhose Flexeel Coil, 1/4" x 20', 1/4" NPT Rigid Strain Relief Fittings, Tran..
PUE14-20-T Coilhose Flexeel Coil, 1/4" x 20', 1/4" NPT Rigid Strain Relief Fittings, Trans..
PUE14-15B-TY Coilhose Flexeel Coil, 1/4" x 15', 1/4" NPT Swivel Strain Relief Fittings, Tr..
PUE14-15B-TR Coilhose Flexeel Coil, 1/4" x 15', 1/4" NPT Swivel Strain Relief Fittings, Tr..
PUE14-15B-T Coilhose Flexeel Coil, 1/4" x 15', 1/4" NPT Swivel Strain Relief Fittings, Tra..
PUE14-15A-TY Coilhose Flexeel Coil, 1/4" x 15', 1/4" NPT Rigid & Swivel Strain Relief ..